This dress has been on major repeat lately! It’s one of the only things left in my closet that I still feel cute (and comfy) in. I’ve been trying to come up with new ways to style it since I’ve been wearing it so much lately so a few days ago I spiced it up with bold and colorful accessories. Looking gorgeous! Love your photos! Stunning comfy and casual look Rach. Have a great weekend! 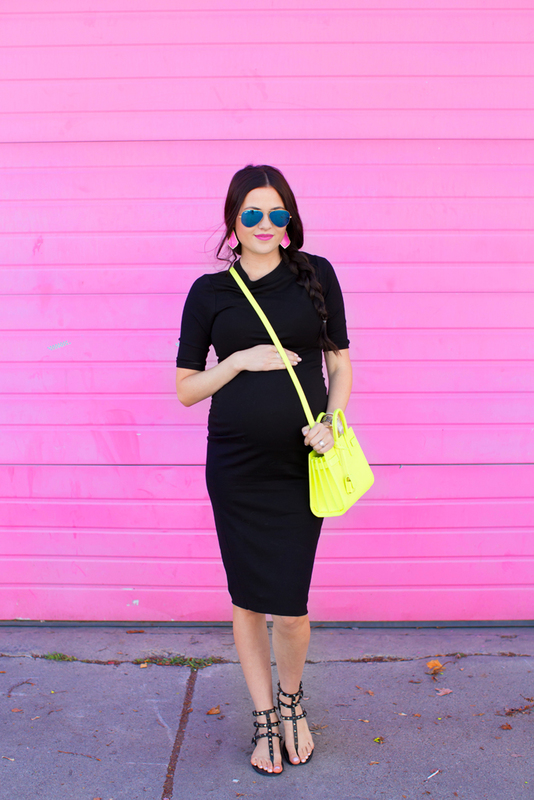 Love how these bright accessories pop with the black dress! Such fabulous sandals, too! Happy Friday! love your outfit soo much! Such a gorgeous look! I love the pops of color! hope you have a great weekend! I never thought that I’d like neon! love how simple accessories change the outfit! look so beautiful! You look so cute! I love all the pops of color! the dress looks great on you, I love the color of the bag! love all your bright accessories! I LOVE the bright pop of color on such a pretty black dress! That little neon bag is so fun! love the bright colors against the pink wall! Love how the earrings match the backdrop! Love the bright pink earrings! Kenda Scott has awesome jewelry, and a great story! I did some work with them, and I love how she runs things. She started with $500 in her spare room and now she has an empire and won the EY Entrepreneur of the year! Total girl power. Love the pink wall you took these pictures in front of! It’s perfect with your classic LBD in front of it. I love how you can make even a simple outfit outstanding. Gorgeous outfit! Love all of the bright accessories! Those earrings match the wall perfectly, they blend right in. Cute dress and I love how you accessoriized it with bold colors! Your sunglasses are amazing and I love the touch of colour your bag gives to the whole look. This dress looks so comfortable! Love how the earrings match the wall! Such a colorful outfit, love it! 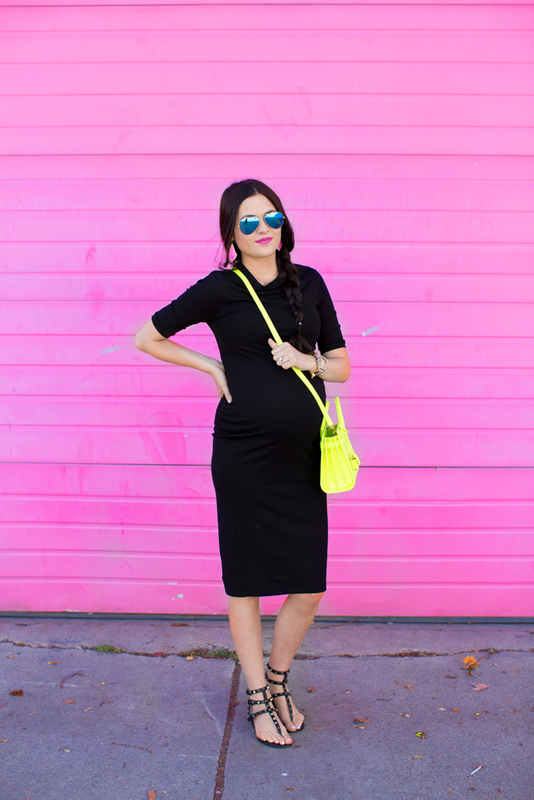 You dress your bump so well! I love the bright accessories! They totally amplify the outfit. You are looking fantastic! Lovely look and you look great! You look gorgeous! I love the bright accessories with the black dress, which all pop against the pink background! Adorable! Ahhh you look so gorgeous!! When are you due!! I’m so excited!!!! The dress continues to look pretty on you! I love a comfy outfit, especially for Friday! I love this look the accessories are so fun! I love how your combined the earring with the background! So cute! I need to get me some cute colored accessories! Thanks for the fun post!! I’m obsessed with those Valentino sandals!! Love the pop of bright colors!!! As always, you are adorable pregnant! For the black dress… Is it stretchy enough to order your pre-pregnancy size or do you need to go up a size for a baby bump? Love the pops of color, you look so pretty! Loving all the bright colors in this look! Well you look adorable!! Adding pops of color to a black ensemble is always a great option. You look beautiful from head to toe. The bright colors make the outfit. 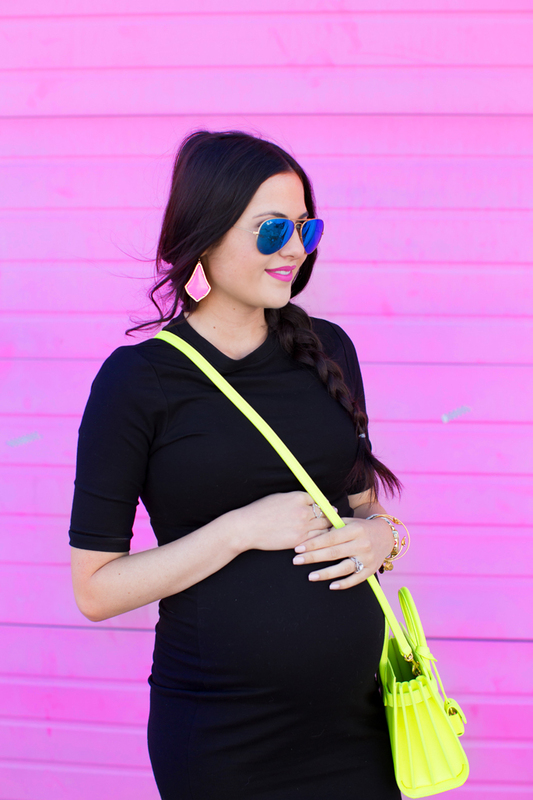 Love these pops of neon with black! I’m in love with this bag! 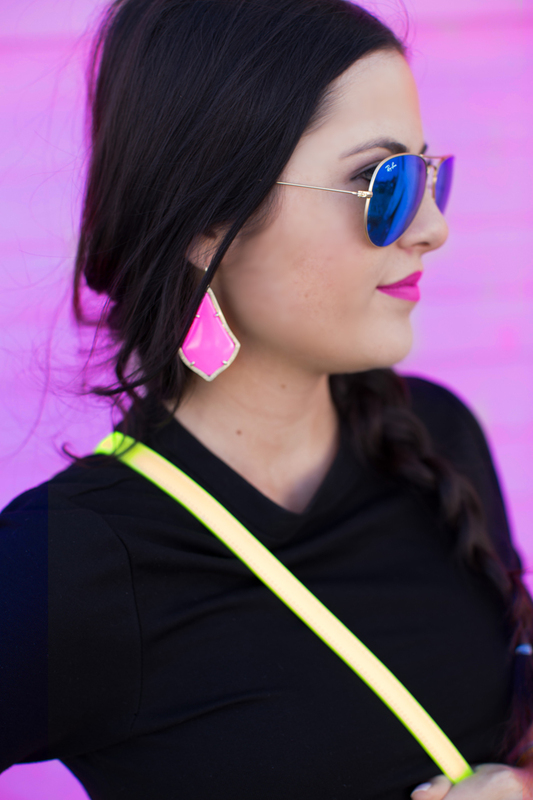 The neon is honestly the perfect pop to any outfit and it’s on trend for this spring! Love it Rach! I have been following your blog for couple years, but it is my first time leave a message. I have a question on the color of this one you are using, what is different between YSL #7? I can’t tell the different from your pictures posted. It will be very helpful if you can give me some of your opinion. Thank you! You want to know the difference between Candy Yum Yum and YSL #7? That dress is something I need for my later months! looks great on ya Rach! also, bright accessories are making it more spring-like and less wintery… Love it! I love how you added pops of color with the accessories. Gorgeous! Hey, How does is the sizing on the black dress? Hey Rachel! I adore your pregnancy style :) you look gorgeous as always! This black dress is seriously versatile. That background really makes your outfit pop! Love the mix of color your used. Love the style. Love the colorful accessories you used to brighten up a simple LBD! So cute!! Love that pop of bright yellow! So gilry and stylish! Love the earings! Congrats! Love the pop of accessories! You look absolutely stunning Rach, as always! Loving the sunglasses w/ the pink lipstick! Rach! I love this dress on you! You are rocking it! I am now 23 weeks pregnant! Yay! You are almost to home run and meeting your little angel! Congratulations! This is my idea of the perfect way to wear a LBD in the spring! I love neon and those sandals are amazing!! I love that you are being creative and finding new ways to style this dress. It gives us all inspiration to reach into our closet and style what we have!! Such a cute dress, loved the accessories too!!! Congrats on the pregnancy, you look amazing! All the best I am also pregnant with my second baby, this time a baby boy. what about you? Love those shoes.. they look the same, but yeah Valentino is Valentino! You look amazing, everything looks beautiful. Congrats on the baby. Love how neon looks on you! Adorable! I love the bright accessories. I always seem to find darker clothes and this is a good way to add color. Thanks for introducing a perfect fashion accessories with us. Looking your style, I’m sure women start following you forever. Great photographs with these fashion accessories. Each one is matching very well on you. You are looking so sweet in this dress. The color of your bag is quite attracting me. I much appreciate you for introducing a perfect combination of fashion accessories here. You are really genius to select the perfect color, size and design of these fashion accessories. Women love fashion and keep up to date yourself but don’t how to select and wear a fashion accessorieSUBMITs with fabulous dress.